Temple temple complex is situated on the banks of the river Batang approximately 22 kilometers east of Jambi city. Being in rural areas Muaro Jambi, District Muaro Sebo, Muara Jambi Regency, Jambi Province. The temple complex is the largest temple complex in Southeast Asia. Twenty times larger than the complex of Borobudur temple in Central Java and two times larger than the temple complex of Angkor Wat in Cambodia. The complex has a spacious 12 square kilometers (about 2062). Muaro temple complex in Jambi, reportedly it is an area of ​​religious worship in the Buddhist kingdom of Srivijaya era. The complex is not far from the Batang Hari river basin. To get there, can travel overland or by river using fast boats. Inside the temple complex in Jambi Muaro have + / - 80 temples, nine large temple. The nine major temples are: Kotomahligai Temple, Temple Kedaton, temples and Gedong Gedong one two, Gumpung Temple, Temple High, Telago Rajo, Twins Stone Temple and Temple Astano. Gedong One unique counted Muaro temple complex in Jambi. Not known exactly when this temple was built. Spacious yard around 500an square meters, consists of the main building and the gate. The shape is very different from the temple are generally in Java. The temple was made of natural stone, but of brick. In each of red brick, there is a sculptured reliefs. Some of these bricks are stored in museums. Around the temple complex there are many historical objects are priceless. Now the goods are stored in a museum city of Jambi. Such as: elephant lion statue, statues also Dwarapala. found in Gedong. Accidentally discovered in 2002 when restoration gate. 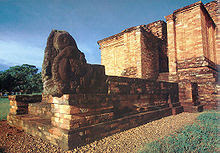 Arca was called to function as gatekeepers, One statue again is ARCA Prajnaparamita, the goddess of fertility symbol. Unfortunately, some parts of this statue has not been discovered such as hand and head. Then there Prajnaparamitha statue, discovered in the Temple Gumpung. Unfortunately, until now his head has not been found. Statues of women, this is a sacred symbol of Buddhism. In this museum also saved cauldron of bronze weighing 160 pounds, height 60 inches, with a pot hole diameter of about one meter. Pot is suspected as one tool flow Buddhist Tantric rituals. 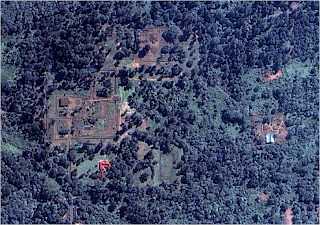 In 1954, the archaeologist Indonesia under the auspices of the Ministry of Education and Culture, headed by R. Soekomo conclude there is a strong link between this site and the kingdom of Srivijaya. 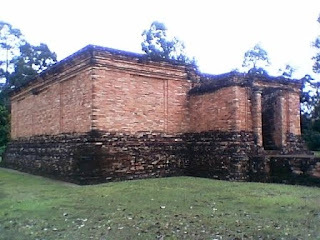 And many who believe that the temple complex Muaro Edinburgh is the capital of the ancient Malay kingdom of Srivijaya or past. Beginning in 2010, there are 11 temples have been restored and is still 82 temples are still buried in the ground called Menapo by people around the temple. Also found pottery, mostly from china Ages 9 to the 14th century. In much smaller amounts were also found pottery from Southeast Asia such as Thailand, Khmer (Cambodian), and Myanmar (Burma) which is made of porcelain or rock material .. Southeast Asian ceramics younger age around the 13th century and the addition of ceramic also found a small amount of glass beads and stones. Also found gold coins, gold rings and gold jewelry pieces. Including the artifacts found at the Site Muaro Jambi. Gold metallic objects are shaped thin plates. And only a few bronze objects found our site Muaro Jambi. The buildings are ancient in Jambi Muaro very close together and many more other ancient objects, to convince the experts of ancient Muaro Sites linking Edinburgh with the ancient Malay kingdom (Sriwijaya). 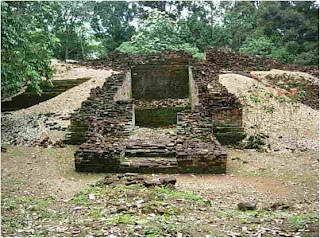 It is reasonable belief that no other site that has a density of ancient temple complex in addition to Muaro Jambi. According to the data, the amount of land newly freed fraction, namely the Temple complex Astano 100 x 200 meters, Temple Height 125 x 200 m, and the Temple Gumpung 150 x 150 m, as well as the Twin Temple Stone 80 x 80 m.
Land perch Gedong I and II of 100 x 300 m have also been released, including the Temple Kedaton 220 x 245 m, Temple Kotomahligai 100 x 100 m, Manapo High Temple 40 x 40 m, Manapo beehive 100 x 100 m, and Talago Rajo 100 x 150 m.
"Funds are budgeted government was minimal, especially Archeological Heritage Preservation Board (BP3), based in Edinburgh oversees four provinces, namely Jambi, South Sumatera, Bangka Belitung and Bengkulu," said Agus Widiatmoko, Documentation and Publications Working Group BP3 Jambi. With minimal funding of the physical changes that look not so obvious. However, every year there are activities, such as revitalization or normalization of the canal around the site Muaro Jambi. Director of Archaeological Heritage Directorate of History and Antiquities Ministry of Culture and Tourism Soeroso, in Jakarta, said that in 2007 there was an activity of the Ministry of Culture and Tourism with the Department of Public Works to work on the sites of potential destinations, including Edinburgh Muaro site. "Activities that have been initiated, among others, making that area of ​​the site Muaro Talut Jambi no landslides and to open up the canals," he said. About the site conditions Jambi Muaro slow its development, is recognized Soeroso, in addition to taking care BP3 four provinces, so that budgeted funds are divided to four provinces, as well as issues of quality human resources from grimy impressed. Do not put people who are experts and love the field work. Head of the Jambi BP3 Tonny Mambo said, Jambi Muaro site located at an altitude of 14 meters above sea level and situated in a plain area which is an area of ​​natural levee of the Batang Hari River (length about 800 km, a width of about 500 meters, with a depth of more than 5 meters). Around the building there is low soil trench around the yard of the temple. According to Tony, attention to antiquiti contained in Muaro Jambi started in 1820 by Captain SC Crooke, an honorary officer of the British. Later by Adam in 1920. Looking at the remains in Muaro Jambi, he concludes, Muaro Edinburgh is a capital city with buildings made of brick / stone. "Allegations of Adam was approved by Schnitger who visited in 1936," he said. After a long investigation, in 1954 a team from the Department of Antiquities reviewing the site location and tracking back what has been reported by Schnitger. The new restoration was started in 1975 until now. 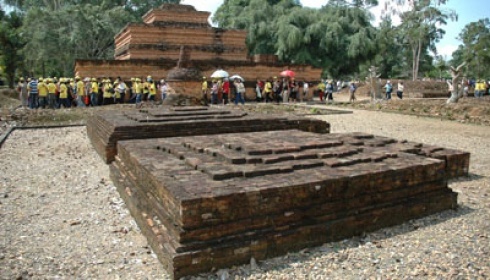 According Soeroso, Jambi Muaro site restoration looks slow progress compared with other sites for enshrinement in Jambi Muaro site consists of brick, not stone like in Java. Reconstruct the temples of brick buildings is more difficult than the temples of stone because it is easily fragile. Researchers at the Center for Research and Development of National Archaeology, Bambang Budi Utomo, said the site enshrinement Muaro Jambi is alleged to have existed since the mid-seventh century AD. This site is a religious site built community groups in the Mahayana Buddhists around the eighth century AD and continued until the XIV century. "Continuity of religious buildings in this place in line with the continuity of the kingdom that ever existed in the Batang Hari River basin. When Batanghari under the control of the Kingdom of Malay, Jambi Muaro used as a Buddhist ceremony Malay community, "he explained. When Batanghari under the control of the kingdom of Srivijaya, a Muaro Jambi Sriwijaya used by the community. There are hints that several buildings in Edinburgh Muaro undergone several stages of development. 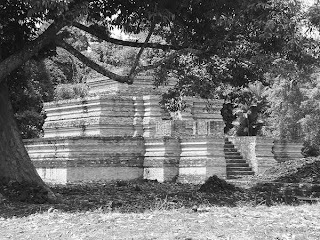 Bambang pointed out, building temples and temple Gumpung Astano. 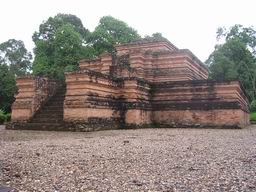 The temple buildings Gumpung allegedly has undergone at least two stages of development. The first building was probably built in about the ninth century AD. Either in what year later the building was enlarged as it appears on the wall when done unloading. 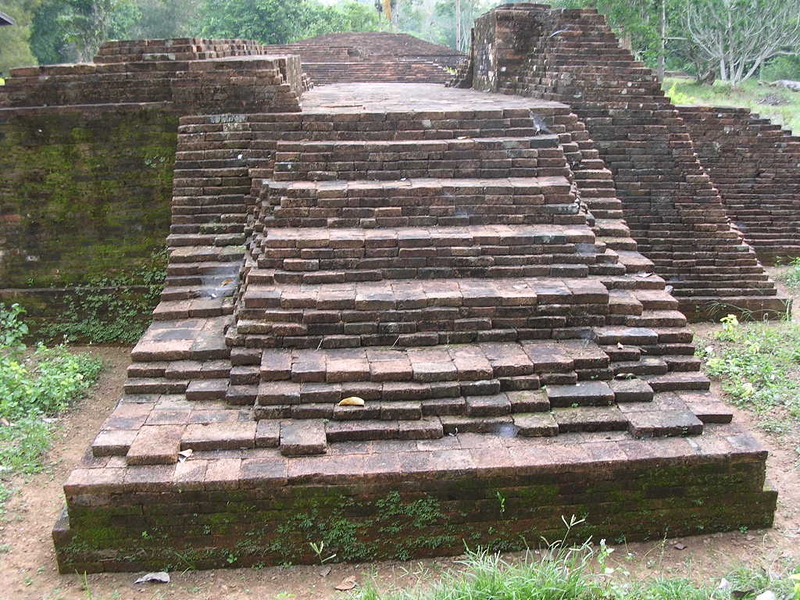 Recent data indicate, when the center-Dharmasraya Malay kingdom was in the area Rambahan (XIII century AD), Jambi Muaro still serves as a place of Buddhist religious ceremonies. Prajnaparamita statue found in the ruins east of Temple Gumpung is the proof. Soeroso explains, Jambi Muaro site currently has prioritized a world heritage. The proposal was listed in UNESCO, 3-4 years ago. 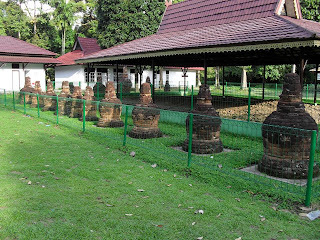 Jambi Muaro site has also been used for religious ceremonies, Buddhist, aligned with the temple Burobudur. 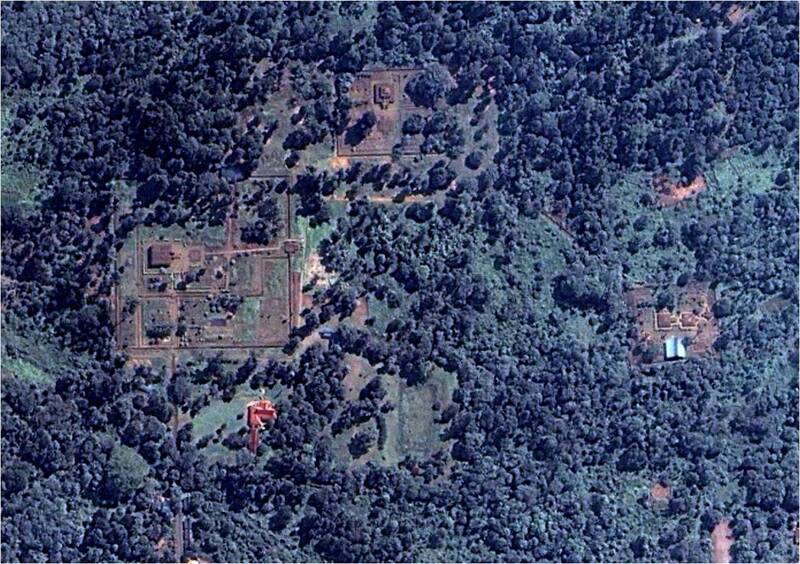 On the site Muaro Jambi also found the rest of the settlement, allegedly originating from VII-XIII centuries AD. 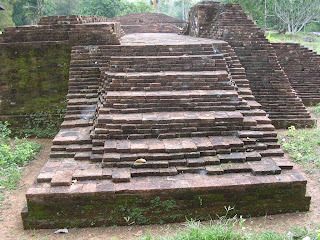 From the site there are indicators pertanggalan sites, ie from short pertulisan found in the ruins of the Temple Gumpung, pertulisan on Bronze Gong in Chinese characters, fragments of statues of Buddha statues in the temple Gumpung Prajnaparamita, and shards of pottery.